Ashton Park community is sold out and is not in active development by builder. 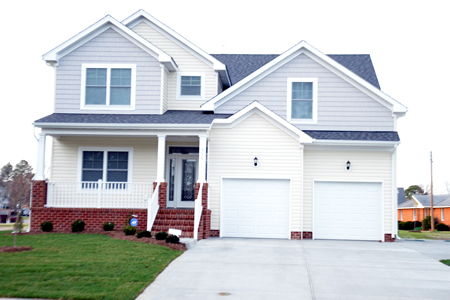 If you are interested in Ashton Park or similar new home communities, contact us today! Our agents are very familiar with new and newer construction in Chesapeake, and can identify resale opportunities in Ashton Park, as well as builder inventory available in nearby or similar communities in Chesapeake. To view more pictures, interactive maps and the full, detailed description of the Ashton Park community, please Login. Located in Chesapeake, VA, this neighborhood offers homebuyers great family homes within one of the most sought-after school districts in Hampton Roads. Shops, restaurants, entertainment and ball fields are quite close too. Military members can easily commute to NAS Oceana, the Coast Guard Finance Center and Naval Medical Center Portsmouth. These new construction homes have stone and brick accents reminiscent of the Craftsman style. Builders knew homebuyers would love this area because of one reason above all others - schools. Many developments can offer lovely new construction homes but not all of them are sitting in top-rated school districts. Houses for sale in Ashton Park allow buyers to send their kids to the acclaimed Great Bridge High School. Buyers get more than a new home when they buy a house here; they get a quality, public education that is priceless. Life in this part of Chesapeake is truly divine. Golfers can head out of these new construction homes to nearby Cahoon Plantation or Battlefield Golf Club at Centerville. Take in some of Virginia’s natural beauty at Northwest River Park. Leave that new home and go exploring in this Chesapeake park that provides the perfect combination of adventure and fun. Visitors can rent cabins, ride horses, go bird-watching, paddle canoes, hike, fish and take time to smell the flowers in the fragrance garden. These houses for sale are also not far from the Centerville Complex soccer fields so getting kids to Saturday morning games will be quick and easy. Send me more information about communities similar to Ashton Park. Our agents gladly offer FREE property tours of Ashton Park, Chesapeake and homebuyer consultations to all serious buyers.